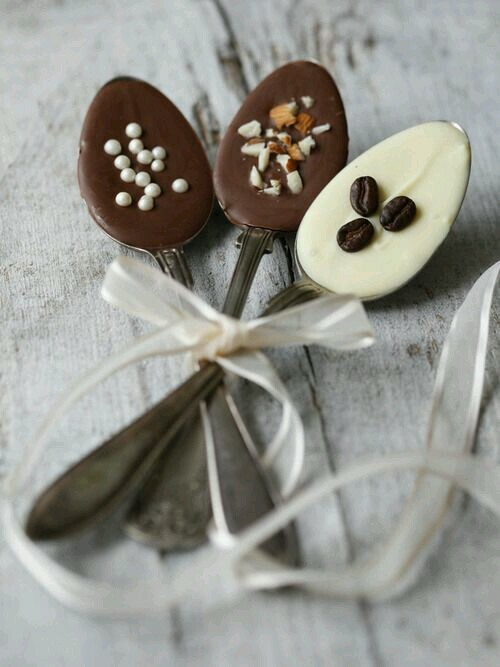 These coffee spoons are a huge hit in our Kaffestuga every year at Lucia. Stir into your coffee for some extra flavor! Place spoons in baking tray with the handles resting on the edge so that they can be filled evenly. Pour creamer into microwave safe bowl. Heat on high for one minute or until liquid begins to froth up. Remove from microwave and add the chocolate chips stirring until they are all dissolved. Pour melted chocolate mixture into a plastic bag and snip off a small corner of the bag. Pipe mixture into spoons and let it set for about an hour before packaging or covering with icing. If you want to cover with sprinkles or candy do this immediately so that it will stick to spoons once they set. If mixture is too lumpy just tap spoons on the counter to even them out. You can use any flavor creamer or add spices to create any kind of spoons you wish. I prefer white chocolate chips to milk because the texture and flavor seems to work out better.